When I was in middle school, every time I pulled out a TTK map of the outline of India, “THE INDIAN SUBCONTINENT”, my geography teacher would yell, “is called so because India has all the types of landscapes you can find in a continent”. “Ok children, now tell me where can you find a desert in India?”, “Rajasthan ma’am” we would say in unison. But this time when I travelled the state through this book(Rajasthan: An Oral History: Conversations with Komal Kothari), I realised that there is more to this land than being an arid patch on the face of the Earth. The heat from the blazing sun might not have slowed progress, cause I feel Rajasthan is a land where the past still lives in the present. The book is all about Rajasthan from the stories that are told and narrated by elders and street artists, these stories – about fact or legend – are reined with the truth about lessons that generations of today will carry forward. This book feels like a transcript of the famous Mr Komal’s narration of Rajasthan as the author has made sure to avoid any discrepancy to the authenticity. The book revolves around culture, lifestyle, religion, and livelihood of the people of Rajasthan. The lifestyle system in Rajasthan is structured and organised. I mention this because great care has gone into the structuring of the different types of land: bêr, sar, dēr, relā. Based on the classification made, the villagers would exactly know what crop goes for farming, the methods used for irrigation, and how to navigate to reach a person’s house. And based on the type and composition of land, the architecture of the buildings change. The architecture also depended on the local botanical availability of resources and this, in turn, influenced the architecture. All the know-how and intricacies from this vast knowledge base have passed down through generations. As the land is arid, water is a resource that has to be utilised wisely and constructively. Believe it or not, Rajasthan is a state where the cattle population is more than the human population. Trade and pricing of the cattle depend on the land, and of course based on the availability of water resource as well. The locals knew how to conserve water for themselves and the cattle, thereby making the usage of water sustainable. What is upsetting is that the government does not involve themselves in consulting with the locals during the construction of a nadi (water reservoir). The knowledge system is priceless because it pertains to the sustenance of the community at large. There were myriad instruments in the Rajasthan culture. Amidst the darkness of the night, the musical instruments would be played along with the stories recited: Stories about Gods, epics and the common things of life. You can assess the strength and richness of an instrument by finding out the number of epics sung with that particular instrument communities. The epic’s richness is then evaluated based on the range of the musical instrument, by the number of dependent communities and the strength of the musical instrument. Rajasthan takes a great sense of pride to revere people who give their life to the service and well-being of the community. This fact fascinated me as I felt that the community considered godly characters in everyone. A bhomiyā is someone who gives his life by taking care of the cows and is worshipped after death. Shrines are built for the bhomiyā and the community gathers around with music and stories. 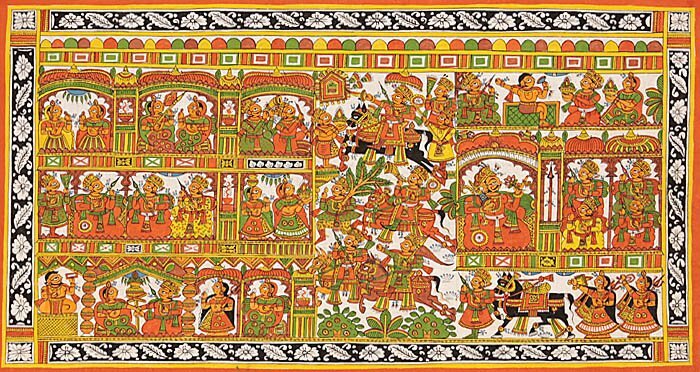 The figure is continued to be revered by nomadic and tribal communities in the desert region of Rajasthan even today. All these ordinary heroes only have the power to intervene in day-to-day’s problems through possible solutions and blessings. And it is not just people who sacrifice their lives to the community gets revered. There are stories of family members being deified. Indeed, this kind of folk tradition does not get contextualised widely. Sati was considered honourable back in those days. Some extreme stages of sati involved not just one woman(widowed or married), but a whole troop of women who would walk into the pyre*. Although it does not make sense in today’s context, such traditions form the underlying philosophy of the land. 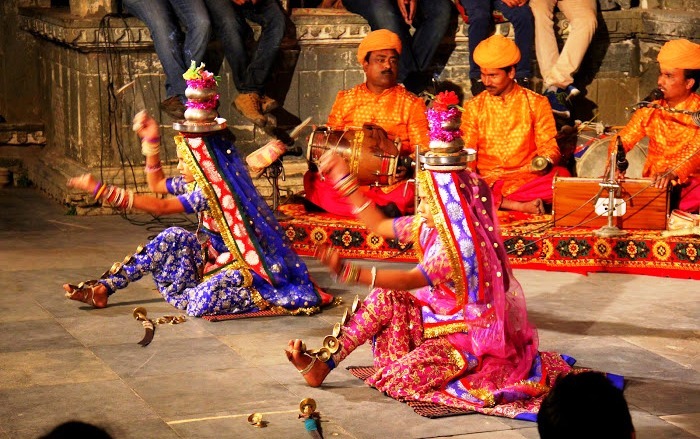 Terātāli – a highly ritualised dance form, which has now been secularised in its virtuoso renditions in numerous Rajasthani cultural programmes. Its importance and significance has travelled both in India and in festivals abroad. In Rajasthan, there is only one tradition of puppetry – the marionette tradition in which puppets are manipulated by strings. The tradition could have migrated all the way to Maharashtra, Karnataka, and West Bengal. At no point in the history of puppetry in Rajasthan, has religion been a factor to contend with. What has to be kept in mind is that both these art forms have survived because of the very concrete support provided by local castes, communities, the people at large, cutting across different traditional religious groups. In the absence of long-term, collective, governance system, the patrons made sure that this art form did not die. Thus Rajasthan, just like the book, is complex yet profound. People did not need “education” as such because the so-called lifeskill was embedded in their everyday life. They have proven themselves through their way of conduct, principle, philosophy, and culture. I am pretty sure that if Google maps could capture the vibrancy, Rajasthan would be filled with colours. The single fact that I adored about Rajasthan is that they stand grounded. Finding our roots in one thing, but standing firm takes a lot of effort. Rajasthan has taught me to stay firm and humble. The well-known analogy is the movie Padmat (Padmavati). She, along with other women walked into the funeral pyre and thus gave the biggest defeat to the enemy of the Rajputs. Great work Arun. I really like the way you were able to keep it concise. Previous Previous post: Technology Aided Conversation – Do we need it? Next Next post: What matters is the missed opportunities.